The story of Markenfield is one of the saddest and most romantic in English history. Deeply intertwined with the fortunes of nearby Fountains Abbey, this great house was one of the most important centres of the Rising of the North in 1569, which was to be its tragic downfall. Tucked privately away along a mile-long winding drive, just three miles south of Ripon, the Hall has been described as Yorkshire’s best-kept secret. Not visible from the road, a glimpse of the imposing east wall cannot be seen until visitors reach the old Mediaeval road near to the top of the drive. 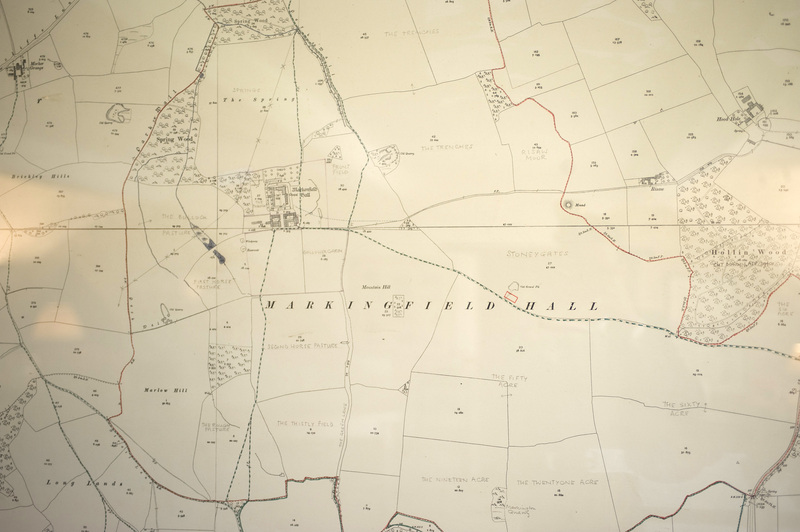 But for a quirk of fate – and a turnpike act of 1777 – Markenfield would be one of the most recognisable houses in Yorkshire and the nearby A61 would run along this now-Bridleway just 200 yards from its façade. As it is, the house is approached from the A61 Ripon to Harrogate Road along a humble farm track, past agricultural buildings and farm workers’ cottages. 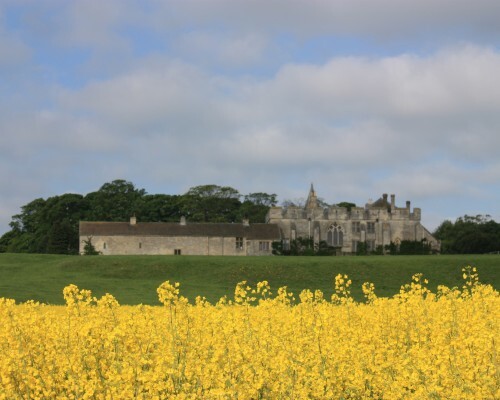 The first mention of the Hall comes in the Domesday Book of 1086 and a house in one form or another has stood on the site to this day. By 1150 the estate had become the possession of the le Bret family. Whether they purchased it from, or were descended from, the owners in 1086 is unclear. The le Brets were increasingly called after the land on which they lived – de Markenfield – this became the family name and they became one of Yorkshire’s most influential and significant families. Recent research by the late Prof Andor Gomme shows that the earliest part of today’s house was built circa 1230. Its Undercroft consisted of the three surviving vaulted ground floor rooms and its Great Hall above has now been incorporated in to the Chapel and Four poster Bedroom above. It was much smaller than the Markenfield of today, and this can be seen in the size of the vaulting and the scale of the rooms. His research states: “I have been long puzzled by how unquestioningly our illustrious predecessors have accepted the two – or strictly speaking two and two fifths – surviving vaulted ground floor rooms as being of a piece with the hall and chapel and the main external walls. [The Vaulted Study contains] unmoulded single-chamfered ribs of the simplest kind. Does this suggest 1310 or even 1290, or is it more likely to have come much earlier in the C13th? To be sure, if we look at the Undercroft at [contemporary] Little Wenham, which is certainly part of the continuous build of the 1270s – we find the same simplicity, though in a more refined and elegant manner. It might be argued that rooms evidently designed for utility or storage could well have been assigned to local masons steeped in the old-fashioned style – but NOT if we are thinking in terms of the brand new house of an upwardly mobile magnate. And what this vault looks back to is surely that of the [Ripon] Minster chapter house, still Romanesque in profile but already with chamfered ribs, which can hardly be later than the very early C13th. “One moulded corbel-springer remains in the Utility Room is a simplified version of those in the chapter house. It is clear that by 1310 or thereabouts the whole of the main structure of the house had a vaulted Undercroft, but of the vaults under the hall and to the south and the west of the east block – only the scars of wall arches have survived, identical in profile in the Undercroft and the west wall of the Drawing Room. These are however enough to show that the vault profiles of de Markenfield’s building were much flatter and broader than those we have just been looking at. Pre 1310, of which very little is known. 1310 to 1569 – the time of the Markenfields. 1569 to 1761 – a time of absentee Landlords. 1761 to 1980 – the house came back in to Norton family, but remained a tenanted farmhouse. 1980 and beyond… a time when the Hall once again became a much loved family home. Please click on the dates above to discover more.